Since 2006, the Grant Pool has awarded 42 separate grants to 18 organizations, totaling more than $528,000. 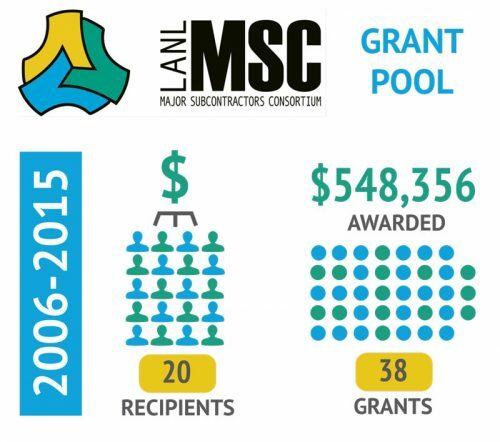 For the last four years, Los Alamos National Security, LLC (LANS) has matched MSC member donations to the grant pool. In 2016, LANS will match up to $40,000–a critical component to the growth of the Grant Pool. The MSC Grant Pool focuses on supporting organizations that collaborate within their community to create synergy, grow jobs, and strengthen the economy. By working together, the MSC estimates that these groups have impacted the lives of tens of thousands of New Mexico and positively impacted the economy by tens of millions of dollars. The MSC Grant Pool focuses on supporting organizations that collaborate within their community to create synergy, grow jobs, and strengthen the economy. By working together, the MSC estimates that these groups have impacted the lives of tens of thousands of New Mexico and positively impacted the economy by tens of millions of dollars. Grants awarded for a project to revive their charcoal production business to create a viable business around charcoal production that will contribute to the integration of forest restoration and the profitable use and management of Picuris Pueblo forest slash and biomass resources, as well as create jobs for tribal members, and expand business and income to the tribe from charcoal sales. Multiple grants awarded for work to improve income levels and access to resources and capital for entrepreneurs in Mora County by providing one-on-one coaching, networking and helping business owners’ access resources and services using a growing community network. In the summer of 2014 the MSC was awarded a small grant to produce a short film highlighting the regional economic impact of our Grant Pool investments made the previous year. We traveled rural New Mexico to capture and showcase the work and the beneficiaries of these investments. From entrepreneurs in the cool mountain community of Mora to the traditional chile farmers in the beautiful Chimayo valley, support was provided to businesses including farmers, wool growers, weavers, wine makers and a specialty soap company, to name a few. The Grant Pool is managed by the New Mexico Community Foundation (www.nmcf.org). Click here to learn more about the 2015 Grant Recipients.